Right after I put down Fangirl I picked up Eleanor and Park and by right after I mean a couple of days. I read Chasing Hope in between, which I totally don't regret. I enjoyed Fangirl so much that I needed to read another book by Rainbow Rowell. It's kind of how one becomes a fangirl, one minute you hear a cool band the next you dedicate your whole life to them. It's just the same with reading, before you know it you have been absorbed by the pages . Come on, I can't be the only person who experiences this. I've read two books in two weeks while getting homework and blogging done. Isn't life just wonderful? I just passed 5 months since I cut my hair and now my life is falling into place. This is no coincidence, my hair was a mess and so was my life. I'm getting distracted, back to the review. Eleanor and Park. I loved this book, I love every book so let's get into the details. Eleanor and Park is Rainbow Rowell's first novel and was published in 2013. 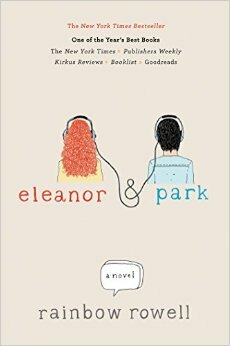 The book contains both Eleanor and Park's points of view which often changes between the two of them throughout the book. I absolutely love this style of writing. I'm never in the dark and I always know what the characters are thinking. The book is what I would describe as a non-cliché cliché. It has all the elements of a cliché love story. Boy meets girl, they fall in love and then something happens. However, the characters and the setting is anything but cliché. If you haven't guessed it, Eleanor and Park are the main characters. What? No way? Park is a half Korean boy and Eleanor is a chubby, red haired girl, they are both sixteen years old. They meet on the bus to school on Eleanor's first day. Park pays no attention to her but rudely forces her to take a seat next to him after she stands awkwardly in the bus. Eleanor continues to take a seat next to Park everyday on the bus. Soon Park realises that Eleanor is reading his comics over his shoulder and starts putting the comics in between them. They continue reading comics on the bus without saying a word to one another and one day he hands her the comic to take home. Eleanor and Park lead very different lives. Eleanor is exposed to abuse and bullying and Park is just left alone. Despite their differences they manage to intermingle and share the interests they have in common. Opposites attract, right? They get to know one another and become closer. This is just a wonderful book, I think Rainbow Rowell has earned herself a slow clap. This book shows us that a perfect love story isn't always perfect. It can feature the most unexpected people and happy endings come in different packages. "It was the nicest thing she could imagine. It made her want to have his babies and give him both of her kidneys." "I want everyone to meet you. You're my favorite person of all time."